Ok, I was going to do these pages two at a time, but I’m going to be honest with you. I am so sick of writing about this busy book. I mean, I was so excited to show it to you at first, but since I can only manage to get out 1 or 2 posts a week, it’s just been dragging on. And I don’t want it hanging over my head anymore. I want to post about Christmas stuff now. So here are all the rest of the pages with instructions. Pages 7 and 8 are the clothing pages, made from cut-up jeans & overalls. This is the back pocket of a pair of jeans of mine that had a hole in it. 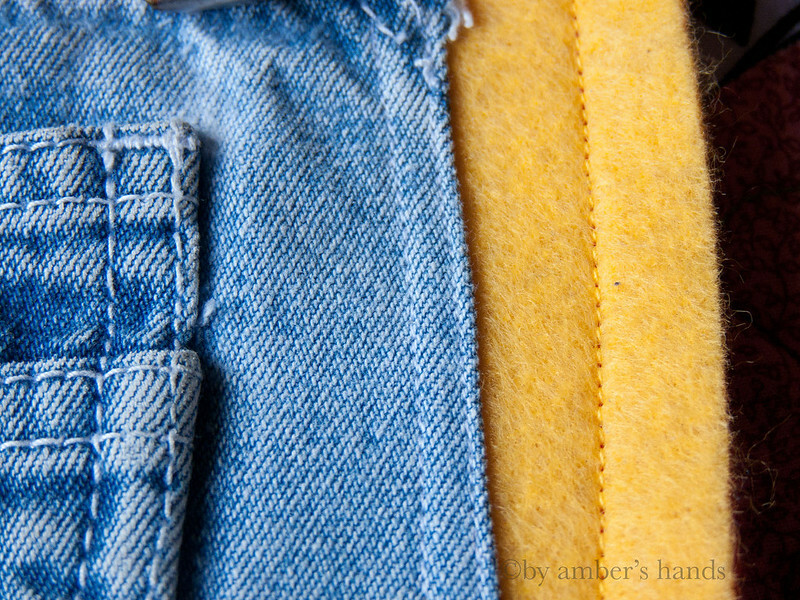 I used gold thread to match the jeans. I had intended to sew a ribbon inside the pocket & attach a keychain to it, but ended up deciding that the pocket could be for whatever Little Man wanted to put in there. For his benefit, you know. Not because I didn’t want to do extra work. I didn’t do Heatn’ Bond on these pages for some reason, so you can see the edges have just the littlest bit of fraying. 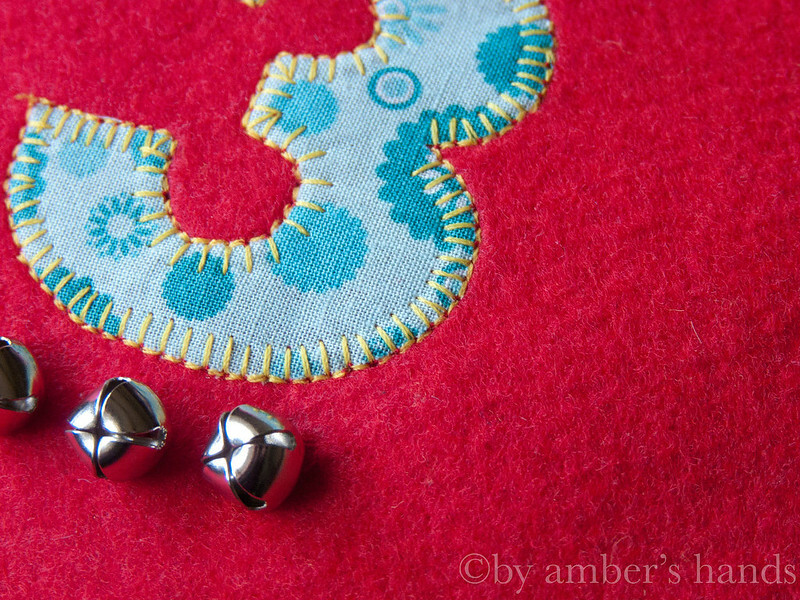 I just pinned the pieces on the page & sewed them on. 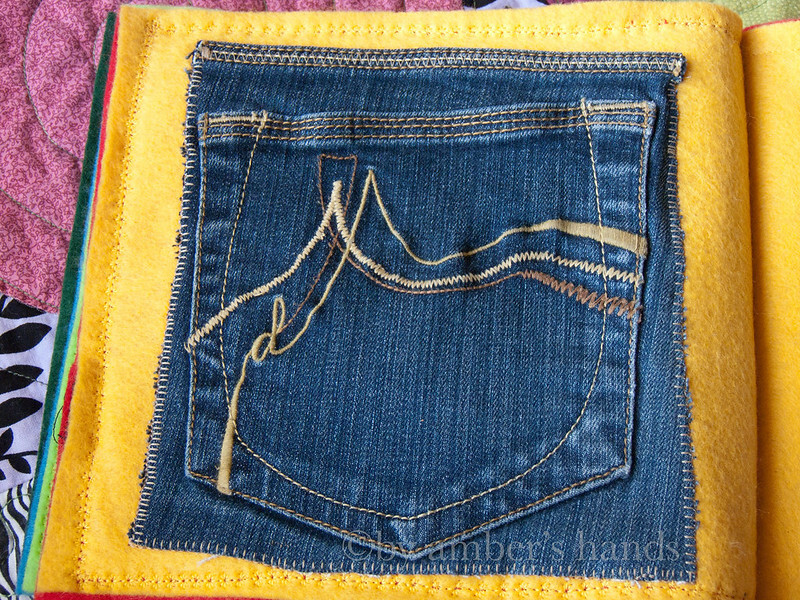 I used a blanket stitch around 3 of the sides. 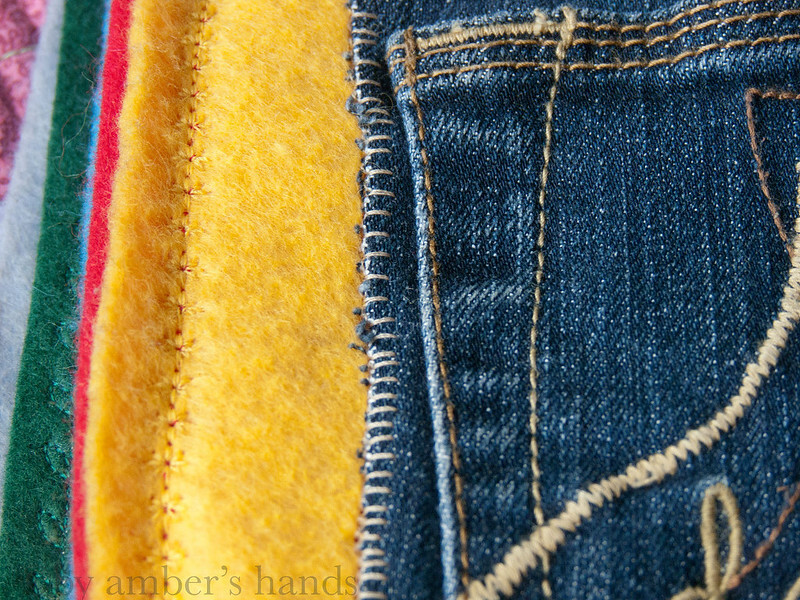 Since the top of the jean piece had a seam on it with a lot of stitching, I decided to use a zigzag stitch to sew it down so it would be easier to get it to stay down while sewing and so the stitch wouldn’t be adding yet another straight stitch. I think it looks like it could have been on the jeans all along. 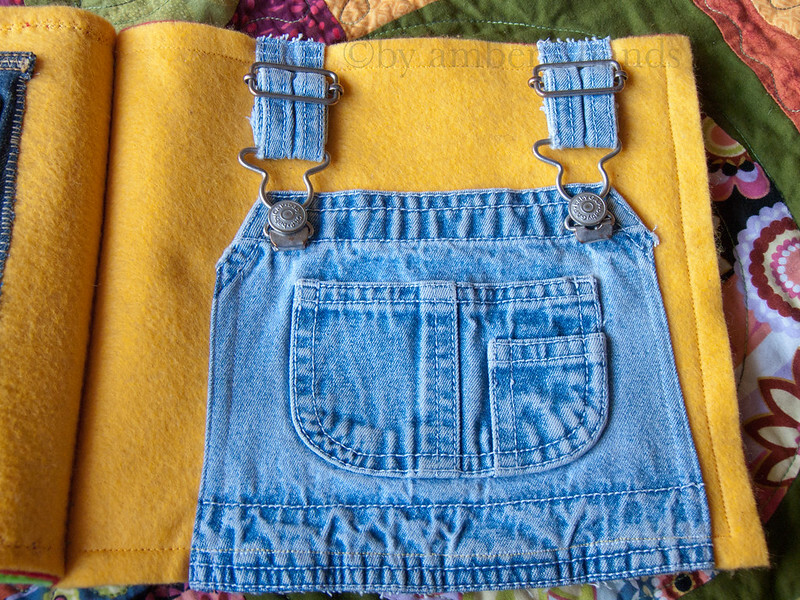 For the overalls, my mom and I cut a pair of old infant overalls apart. Little Man inherited about 500 hand-me-down overalls. He potty trained at about 20 months, and since then, overalls are not the most useful to us. Ha. I picked the ones where the buckle was loosest, since they would be less useful to anyone to wear, and so it would be eaiser for Little Man to use. 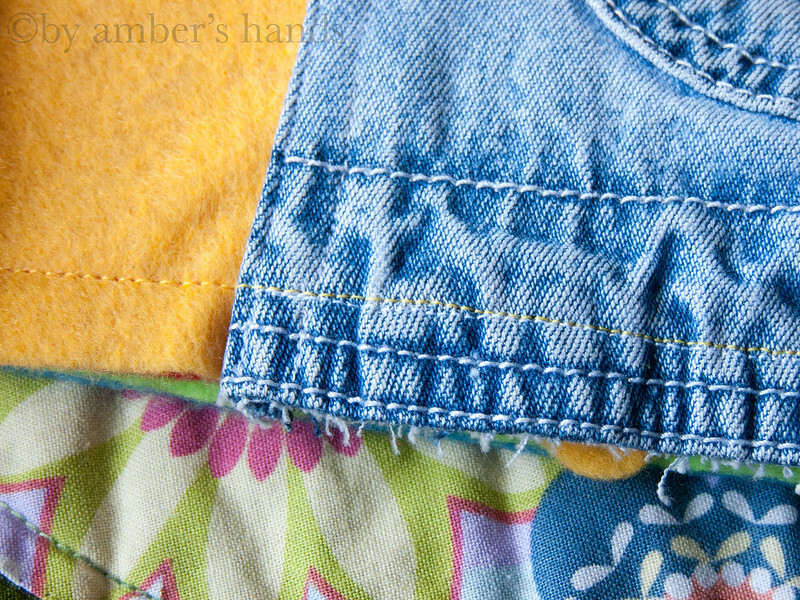 I hemmed the sides of the overalls before putting them on the page. I used white thread to match the rest of it. When I did attach it, I sewed it really close to the edge on the two sides, but didn’t sew down the top. At the bottom, I decided to have the overalls go down to the bottom of the page, but if I were to do it again, I think I wouldn’t. It ended up being really bulky and I had a hard time getting it to line up well with the page when it all came together. As you can see, I sewed it down with white up a bit higher from the edge because it was just too bulky at the bottom to sew through easily. Then when I sewed this page to the page behind it, the stitch landed in the same spot. Ooops. This was also the one page on which I didn’t use a decorative stitch to put the pages together. The straps I sewed on with two parallel stitches at the very top of the page to hold them on securely. 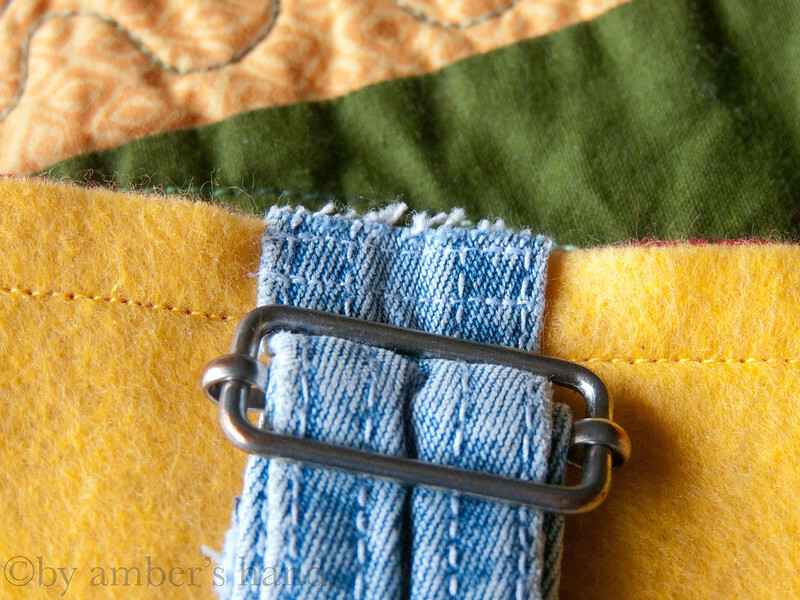 You move this kind of buckle easily to get it out of the way when you sew it. Pages 9 & 10 are the numbers & shapes. For the numbers, I printed out some large numbers on the computer to make a template, then used them to cut out the fabric. Heatn’ Bond again to adhere before sewing. I used the same color thread on all of them because I was lazy I thought the contrast would be interesting. 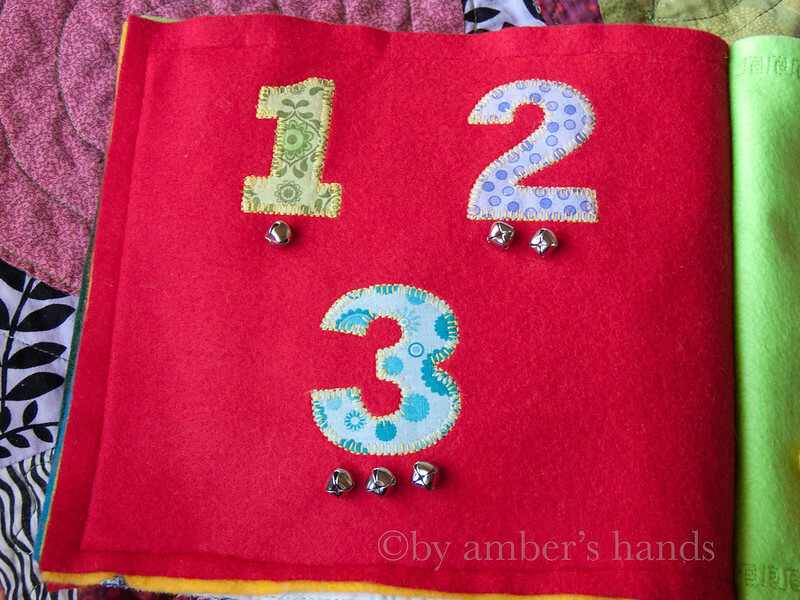 The bells went on after the numbers were stitched. 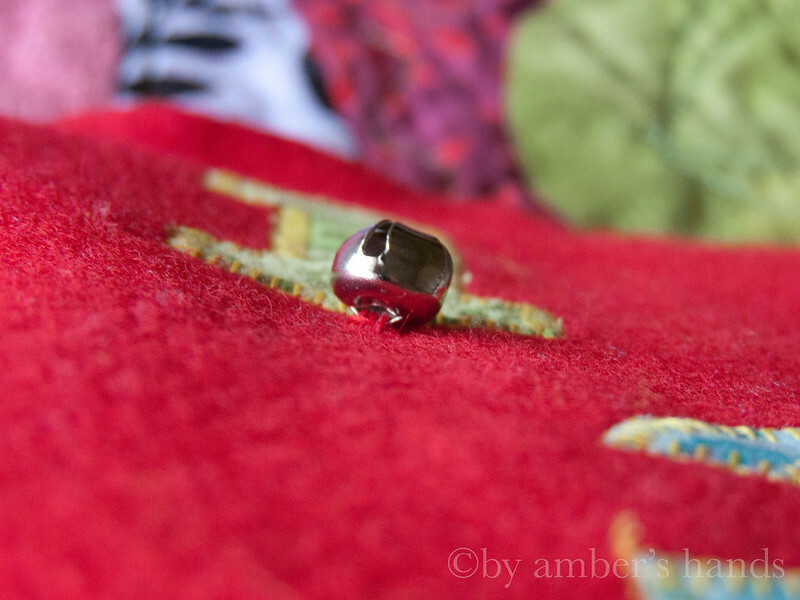 I first used my regular thread, and then the next day Little Man saw it and immediately pulled one of the bells clean off. So I went out and bought heavy-duty thread and sewed the one that fell off, plus I added more stitches to the others. 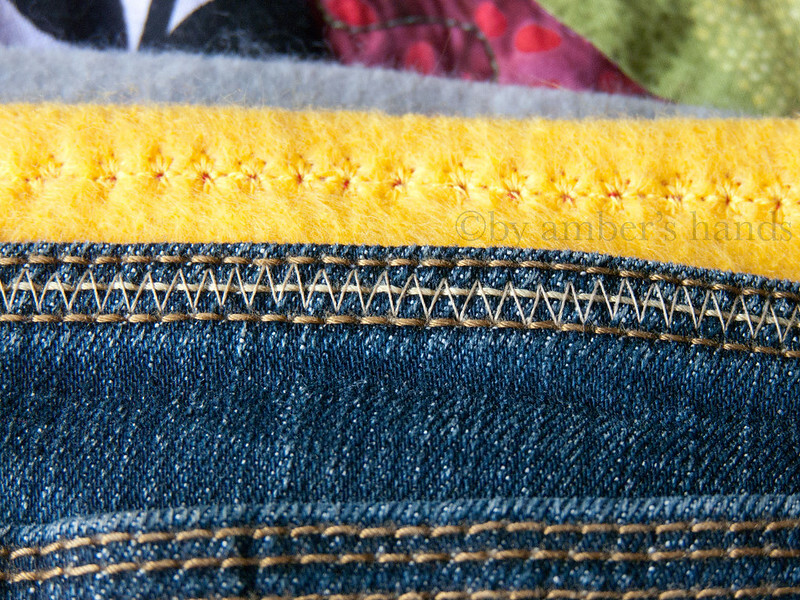 The part that you stitch onto is actually kind of sharp, so it easily cuts through regular thread. This last page should have been really really simple. 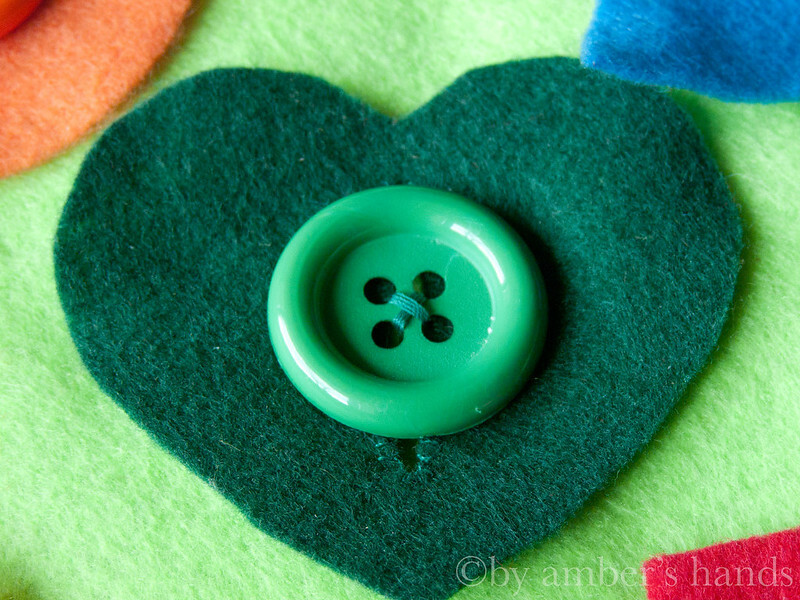 Unfortunately, the buttons I chose were too big for my buttonhole foot on my machine. Boo. I ended up having to sew button holes by hand, which I’d never done before. I made templates for the star and the circle, but just free-handed the rest. Then I sewed the buttons on by hand as securely as I could. I used a bamboo skewer behind the button as I sewed to leave a gap, then when I had finished stitching, I wrapped the thread around behind the button several times before knotting off. I made the mistake of letting LM play with this page a few times before stitching the buttonholes, and the cut holes stretched out a bit. When I sewed the buttonholes, I used a very small blanket stitch, but put a tiny knot at the top of each stitch to keep it strong. I’m sure there are other, better ways of stitching a buttonhole, but the other one I tried didn’t work for me. BASTE! Baste all of the pages together before sewing them on the machine. You will thank me for it. I sewed the first and last pages to the cover, leaving a couple inches in between for binding. You’d be better off cutting your cover a little long and then trimming it down if needed. 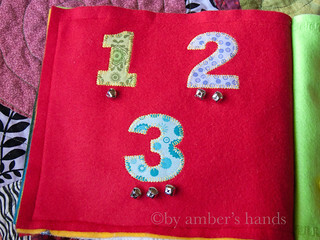 Lay all of your pages in the cover before sewing the first and last page, and then make adjustments as needed. I made my cover line up with the edges of all the pages, roughly. But because of the nature of felt, it doesn’t line up perfectly. I’m ok with that. I printed out “My Busy Book” in a font & size I liked to use as a template for the cover. Then I Heatn’ Bonded the letters on and machine sewed them before putting the first & last pages on it. When I went to sew the binding, I found it really difficult. I doubled my thread for strength, and used a dissapearing pen to make a straight line. Even then, things weren’t terribly even. It was too thick to pin in any way, so I just had to hold it together. In the end, the pages were tighter at the top of the binding than at the bottom because it slipped a bit as I was stitching. I used basically a straight stitch when binding, then went back the other way, going through the same holes, but having the stitches on the opposite side. I don’t know if that makes any sense at all describing it. Basically, where the first stitch went down, the second stitch went up… Not sure I’m making things clearer. This project took up a fair amount of time, but really wasn’t difficult. 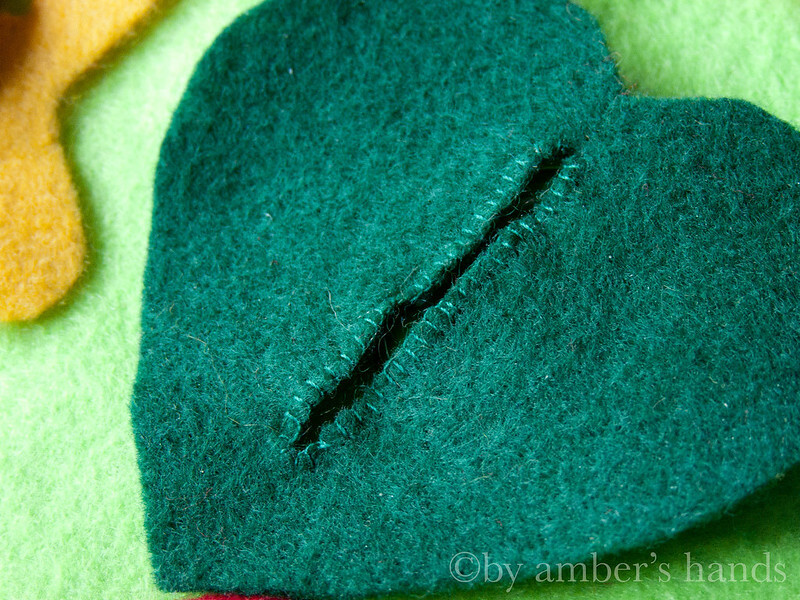 Felt is overall pretty forgiving, unless you have to rip out machine stitching. Then it’s terrible. Well, that’s it! 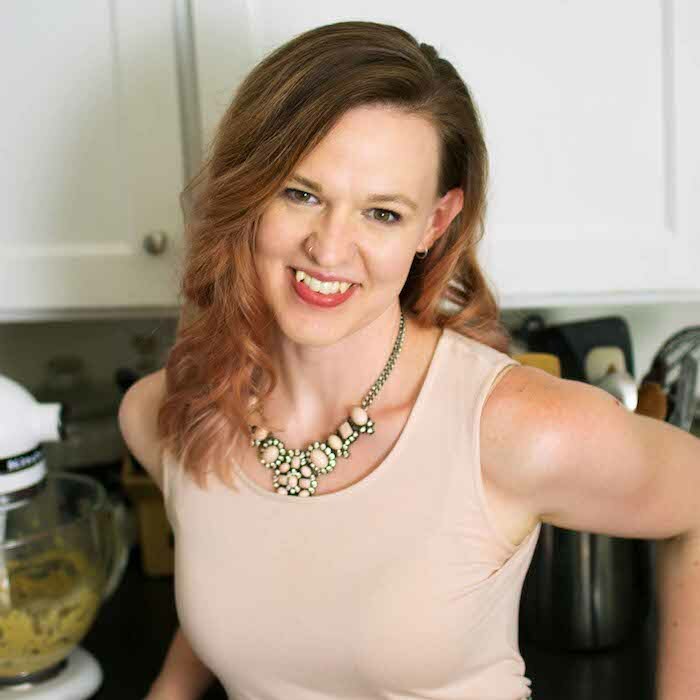 When I get a chance, I’ll update the first page’s post to reflect a fix I have to do. But other than that, this is how I did it all!